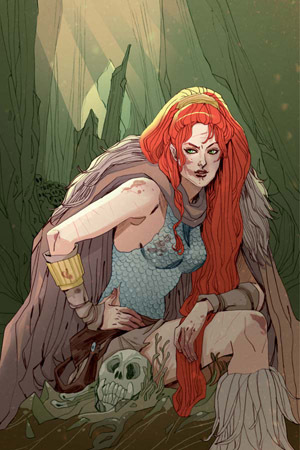 Marguerite Sauvage (DC Comics Bombshells) provides this intense cover artwork to the third issue of the redesigned Red Sonja's adventures, available here as a super-rare "Virgin Art" variant! In this issue, Sonja is hunted by her own King's elite assassins and forced to hide - even among her ex-lovers! With the aid of those from her past, she must rally a rebellion against the new despot, ending his dreams of conquest. Sonja plots a desperate gambit of her own as Hyrkania teeters on the brink of Civil War!